Circle City Copperworks offers smooth and hammered copper products. Our products range from Smooth, to Light Hammered, all the way to what we call Medieval Hammer, which is extremely hammered like the picture to the right. We do not have a set pattern to our hammered copper. It does not have the same size hammer marks nor are they in a straight line pattern. Our hammered copper is totally random, which creates an organic aged look and feel. We do not charge extra for hammering on most items. Hand hammered spun sinks, for instance, are one item where hammered is an extra charge. In many cases a hammered product is slightly less expensive than a smooth one. Imperfections in welding and grinding may be created while hand making smooth copper products. In order to get the product back to as smooth as possible, it takes much more sanding and polishing. When sanding a hammered product, the welds and grind marks blend in more easily, making hammered products take less time to fabricate. We will make any type of copper product that you desire. However, we want all customers to consider the environment in which your copper product will exist. If you are ordering a copper countertop that will be used every day, you might want to at least think about a hammered finish. Even thought we build our countertops from .070 thick copper, and permanently adhere them to the substrate, copper is still a soft metal. If you drop something hard and heavy on it, or scratch it deeply, it will be very noticeable if it’s a smooth top. If it’s hammered, the scratches and dings will always blend in. In those rare circumstances, we can help talk you through how to repair that scratch over the phone, and if it’s hammered, it will blend in much better than smooth. Circle City Copperworks offers a wide variety of patina colors. We use many processes to get the desired color for you. None of these processes we use to patina copper use harmful chemicals. The natural processes we use are harmless to the environment and to us. See below for a variety of patinas that we can offer you. If you have a special request, let us know. We have an encyclopedia of patina colors we can pull from. We would be happy to apply a special patina for you for an extra cost. Please understand that doing a patina on copper is not an exact science. Patinas can vary, and the finished product may come out just very slightly lighter or darker than the picture and/or sample. You should also be aware that different lighting will make the copper look lighter or darker. This section discusses the different finishes you can get after a patina. A living finish starts as a bare copper. Bare copper will oxidize and start to change colors over time, which gave it the name "living" . The color and rate at which it oxidizes depends on its environment. The living finish option will come with a coat of wax on the copper. We apply a wax to protect it from finger prints during unpacking and/or installation. The wax, if not re-applied, will eventually wear away over time and allow the copper to oxidize and patina. Mostly we sell custom copper products with a patina and a wax coating only. Most products will need re-coated with wax over a certain period of time. Just once a year (or less) for a range hood that is rarely cleaned, to possibly once per month for a sink that is used and cleaned often. Wax provide a barrier only to protect your patina. It essentially "buys time" for you to wipe off or dry off liquids. A liquid allowed to sit on the copper with a wax coating, will penetrate the wax and create a patina spot on the copper. If you want to keep the same look, it may be best not to allow anything to sit on the copper for many hours. For the mediums, dark, and both mottled colors, a new patina spot typically is not as noticeable. Also, bear in mind that copper will "live", and those spots will "blend" in as well over time. Do not worry. Remember that patina is copper's way of adding its own barrier to protect itself. The patinas are not an erosion, but a layer of protection. The copper is not wearing away. You can see copper existing for hundreds and even thousands of years in Europe, proving that copper is a lifetime product. For this reason, we typically steer customers toward the wax only coating. We can also offer an option for an applied clear coat. Clear coat is the best protective coating you can use on copper products to protect its patina from changing, however it may need to be reapplied after many years. Depending on what the manufacturer of the clear coat advises, and its environment, it may last 5 years, or it may last 50 years. The copper itself will last forever, just not the clear coat. 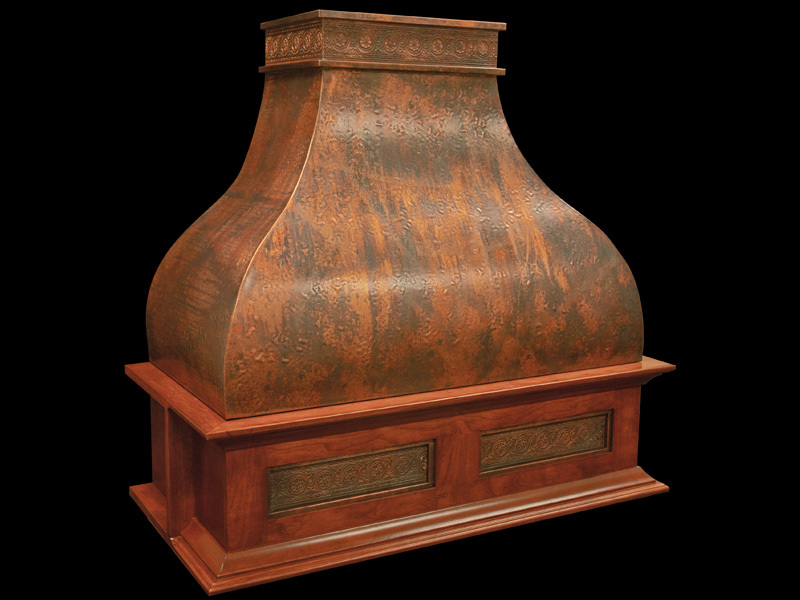 Consider the environment that your custom copper product will exist in. If it will constantly be exposed to water, cleaners, spills, etc., you may want to consider a clear coat. Sinks especially, and occasionally countertops are two products in which clear coats are most often applied. Bars and restaurants often request a clear coat sealer, so that leaving water or other liquids on the copper for long periods of time, aren't a worry. If you are after the anti-microbial properties of copper, then a living finish without wax is the way to go. Keeping the copper bare keeps the copper anti-microbial. Adding a patina and letting the copper turn colors creates a layer of oxidation between surface contact and the coppper. Copper will lose some of the anti-microbial properties of the copper if not kept bare. The living finish and our standard patinas with a waxed finish are all included standard in the price of our products. Clear Coats are a added charge and depends on the size of the product. See the swatches below for our surface textures, finishes and patina options. Click Below to Enlarge!